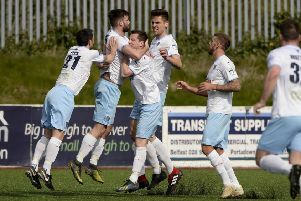 Ballymena United's Cathair Friel celebrates after scoring his seventh goal of the season. Ballymena United secured their biggest win of the season in this crazy nine goal encounter. Striker Cathair Frield was instrumental in United’s winning disaply, but in truth both managers won’t be happy with their side’s terrible defending. The ex-Limavady United man set-up three goals and also headed home their third goal early in what was a goal feast second half. United took the lead on 17 minutes as a neat move down the left ended with Friel’s clever cut-back finding Gary Thompson, he took a touch before blasting home from 14 yards, but Ards keeper Sam Johnston will be disappointed with his attempt at trying to keep the stinging effort out. Minutes later and with their tails up United went close to adding a second as Leroy Millar’s left wing corner found Kyle Owens, but the big centre-back’s powerful header was kept out by a diving Johnston. The home side doubled their lead on 29 minutes after more terrible play by Ards when Michael Ruddy’s weak back pass was short, Friel nipped in before being brought down by the out-rushing Johnston, referee Ian McNabb played a good advantage and Andrew Burns gleefully turned the ball into the empty net. Ards, who were struggling in the opening half hour pulled a goal back on 36 minutes as David McAllister’s corner was poorly defended by the home side and Gareth Tommins made no mistake firing home on the half-volley from close range. More good play by Joseph McKinney saw him skip away from Reece Glendinning before his low centre was turned goalwards by a sliding Kevin Braniff, but Ruddy cleared off the line. In what was an action packed few minutes Ards should have levelled things on 40 minutes after a defensive mistake by Owens, but striker Guillaume Keke saw his first strike saved by Brennan and he blasted the follow up effort over. A super flowing move from United on 48 minutes ended with Braniff feeding McKinney down the left, but his side footed strike was well saved by Johnston. United did add a third on 52 minutes as Millar’s left wing free-kick saw Friel nod home his seventh goal of the season. Just after the hour mark Keke’s 20 yard free-kick from the left hand side of the box nearly caught out Brennan, but the United keeper kept it out. United netted a fourth on 77 minutes before all the madness started when Andrew Burns played in Joseph McKinney and the winger slotted the ball past Johnston. Incredibly there was three goals in as many minutes as the Braidmen decided to try and throw the game away with some poor defending. Firstly substitute Ben Arthurs pulled a goal back after a goal mouth scramble, then a minute later Owens stupidly ran into Tommins inside the box and Ruddy made no mistake with the resulting penalty to make it 4-3. Just as Ards thought they might nick a point they conceded a fifth goal as Millar headed home from close range, after Braniff’s cross created the chance. In the last minute Arthurs gave away a penalty when he brought down Friel and Braniff completed the goalscoring feast. Ballymena United: Brennan, Owens, Gault, Thompson, Friel, Braniff, Burns, Ervin, McCullough, Millar, McKinney. Ards: Johnston, Glendinning, Elebert, Taylor, Ruddy, McMillen (Arthurs 63), Tommins, Hanley, McAllister (Mitchell 56), Keke (McLellan 84), Byers.